With 35 years of experience, Hyatt Regency Austin has perfected the art of meetings. From the small details to the big decisions, our dedicated and knowledgeable team of experts will assist you every step of the way to ensure a seamless and stress-free experience. The newly-renovated property features some of the most beautiful and unique venues in the city, from the Foothills Ballroom, which provides sweeping, panoramic views of downtown Austin, to the brand new Zilker Ballroom, a fully-adaptable meeting space to fit the needs of any event. 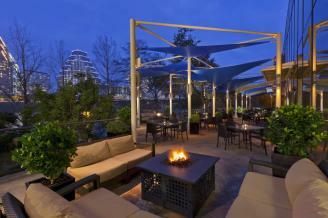 Located on the shores of Lady Bird Lake and situated right next to the Congress Avenue Bridge, Hyatt Regency Austin’s unique setting provides an ideal downtown location for any gathering. From outdoor activities such as kayaking and biking, to visiting the city’s iconic attractions and experiencing the famous music scene, the best of Austin is available right in our own backyard. Description Take your meetings and events to the next level with our downtown Austin venue. With over 33,500 feet of flexible meeting space, expert audio visual services and creative catering, we've got you covered whether you're planning a board meeting for 10 or a conference for several hundred. Your attendees will also appreciate easy access to everything the "Live Music Capital of the World" has to offer. 10% discount at hotel restaurants!